Sample plates are produced by manufacturers of ceramic tableware as a means of demonstrating the colors with which items, usually in a particular product line, could be glazed. Sample plates provide insight into the colors—and, in some cases, decorative patterns—that were available and popular at particular moments in time. The Cooper Hewitt collection includes several ceramic sample plates spanning nearly a century, from the 1880s to the 1970s, when this plate was made to illustrate the glaze colors available on Buffaloware, a line of Buffalo China. Founded by The Larkin Company, a soap manufacturer, in 1901, Buffalo China produced soap dishes and other ceramics that were offered as premiums for purchasers of soap. The Larkin Company’s desirable premiums (including furniture, glass- and silverware, apparel, tea, coffee, chocolates and more) led to its extraordinary success, measured by annual sales of $28 million in 1920. The company’s headquarters in Buffalo, NY, was designed in 1903 by Frank Lloyd Wright (and demolished in 1950 after the company’s demise). The years 1922-23 represented the last time Buffalo China appeared in Larkin’s premium catalogue. Thereafter, Buffalo China manufactured ceramic tableware for use by hotels, rail lines, airlines, and steamships, much of it custom designed. In 1940, Buffalo Pottery was acquired by Oneida Ltd. 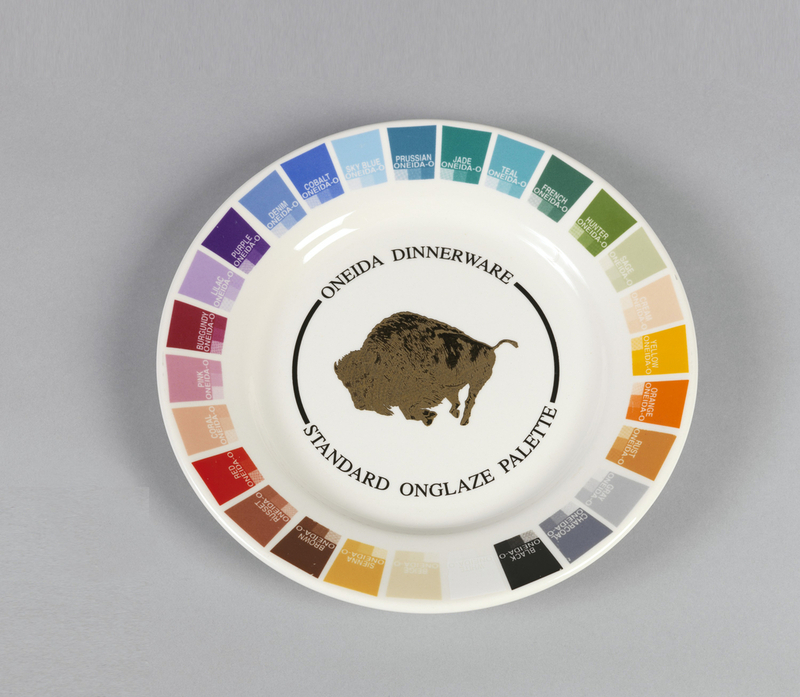 This Oneida Ltd. Buffaloware sample plate is earthenware with a glossy white glaze and features, appropriately, the image of a buffalo surrounded by the “standard onglaze palette”—swatches of the colors available for purchase in the Buffaloware line of dishes, from Sky and Prussian blues to Sienna, Coral, French Green, and everything in between, even black and white. Smaller passages within the main colors demonstrate the different saturations available in the glaze colors. This object is currently on view in Saturated: The Allure and Science of Color (May 11, 2018-January 13, 2019). Nick Stagliano is a Curatorial Fellow in the Product Design and Decorative Arts department at Cooper Hewitt, Smithsonian Design Museum, and a first-year student in the History of Design and Curatorial Studies program offered jointly by Cooper Hewitt and Parsons School of Design. He grew up near Oneida, New York. Howard R. Stanger, “From Factory to Family: The Creation of a Corporate Culture,” Harvard Business School, http://hbswk.hbs.edu/archive/2154.html (accessed 7 May 2018). Violet and Seymour Altman, The Book of Buffalo Pottery (New York: Crown, 1969). “The Oneida Story,” Oneida Ltd., https://www.oneida.com/aboutoneida/the-oneida-story (accessed 7 May 2018). It would be interesting to se, had you shown it, the demolished FLW building. Our lost history is always worth a look to see what the present did not value of the past. How much of the tableware is actually produced in the United States? Where is it produced? Buffalo Pottery was not sold to Oneida in 1940. Buffalo Pottery reorganized in 1956 and became Buffalo China. Buffalo China was sold to Oneida Ltd. in 1983. The references cited above concur with my information. – I am a historian and a member of the family that owned Buffalo Pottery/China from its inception until 1983. I see you have a color labelled Purple on the plate; how do YOU define purple? When was it most fashionable? Does it have any special significance?